Where is Maralinga? Who of our audience would know where it is? It is within the great Victoria Desert. In 1952, the Aboriginals who had inhabited the Maralinga Lands were placed in a mission at Yalata, several hundred miles South of their tribal land. They were kept at Yalata from the commencement of the British tests in 1953 until 1984. . .
Like at Bikini, when the Maralinga people returned to their land they found parts of them highly contaminated by radiation. The British government had detonated nine atomic bombs between 1953 and 1957 and, of greater impact, 700 "Minor Trials" which scattered over the Maralinga Land up to 25 kilograms of plutonium, 8,000 kilograms of natural uranium and up to 101 kilograms of beryllium, a highly toxic chemical. . . . The Maralinga community has considered the TAG options with its scientific and legal advisors and they want all the contamination removed and the burial pits made safe. However, in the case of the 120 square kilometers of bushland contaminated with fine particles of plutonium, the Maralinga people have been placed in a terrible environmental dilemma. The only possible way to decontaminate the plume area is to remove every tree and plant and all the soil to a depth of four inches. The people see this as creating one environmental disaster to solve another and are reluctant to see that happen to their land. . . .
We will tell the British government that we want our traditional lands back and we want them cleaned up to the maximum extent possible. We will be telling the British government that it has a legal and moral obligation to make a significant contribution to the clean-up of the dangerous mess it left behind. Unless this environmental disaster is cleaned up, my people are sentenced to life amongst the pollution for the next quarter of a million years. We are determined that this will not happen. 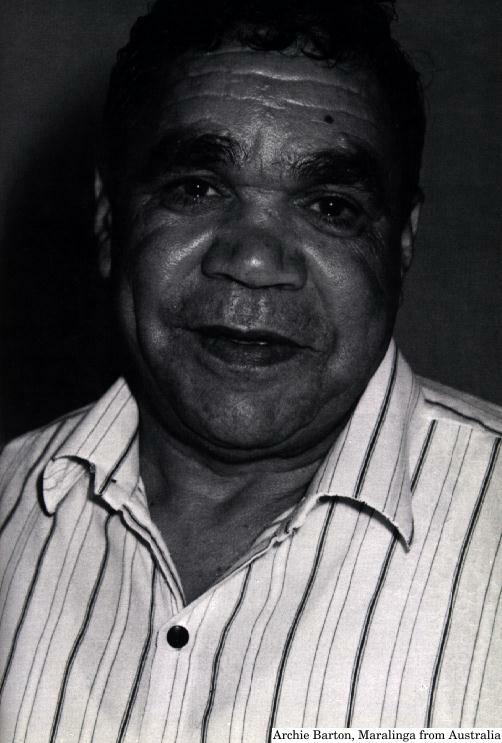 Archie Barton, Pitjantjatjara, Australia. Administrator of the Maralinga Tjarutja (Land Rights Council). 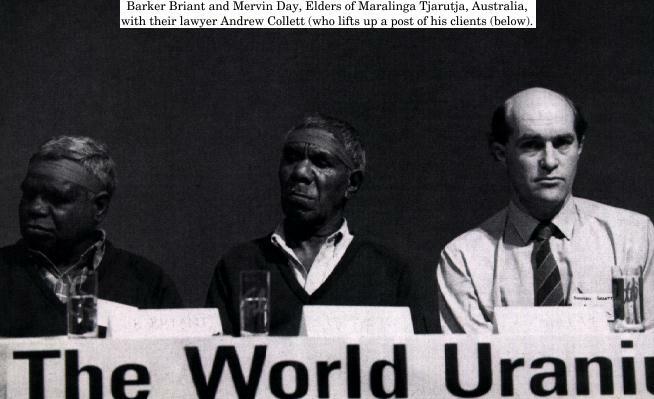 With him are Mervin Day, Barker Bryant (Elders) and Andrew Collen (lawyer). Thank you very much, Mr. Chairman. I'd just like to say on behalf of my delegation, we are very thankful to receive the invitation from The World Uranium Hearing to be present here and join this issue with you. I am Archie Barton, I'm the administrator of the Maralinga Lands. My tasks and functions are guided by the Elders of the land that I administrate. On my left here, I think this is something special I have to tell you, on my left is Barker Bryant, he understands English but can't speak it so much, but it is important that he has been sent here by the community to represent them, giving the delegation the power in our feelings and the strength to carry out what we are on about. Mervin Day next to Barker, he is a traditional owner of the land and he works with the community as a project officer. On my far left is Andrew Collett. He's a lawyer who has been part of the group since 1985 when the Royal Commission took place. He has been representing Aboriginal people throughout that period. Where is Maralinga? Who of our audience would know where it is? It is within the great Victoria Desert. In 1952, the Aboriginals who had inhabited the Maralinga Lands were placed in a mission at Yalata, several hundred miles South of their tribal land. They were kept at Yalata from the commencement of the British tests in 1953 until 1984. Some of the Pitjantjatjara brothers and sisters were injured as a result of these tests. I am sorry that Yami Lester could not come to this conference to tell you how he went blind and how his people were injured by the black mist of the fallout of the Emu test in 1953. The Maralinga Elders tried to return to their land in 1955, but were sent back to Yalata by nuclear test personnel. As an alternative home for the Maralinga people the Yalata Mission failed, thus caused dislocating traditionals which resulted in the highest rate of alcohol-related illnesses and deaths of any Australian community. By 1990, the Maralinga people were determined to return to their land. They commenced a long struggle for landrights which culminated in December, 1984, with the grant of title to the 76,000 square kilometers of their land by the South Australian government. This did not include the former atomic test sites at Maralinga and Emu. Like at Bikini, when the Maralinga people returned to their land they found parts of them highly contaminated by radiation. The British government had detonated nine atomic bombs between 1953 and 1957 and, of greater impact, 700 "Minor Trials" which scattered over the Maralinga Land up to 25 kilograms of plutonium, 8,000 kilograms of natural uranium and up to 101 kilograms of beryllium, a highly toxic chemical. The British government undertook a cleanup of the test sites in 1967 in order to discharge its obligation to the Australian government. However, the British clean-up "Operation Brumby" had no regard to the special problems of traditional Aborigines, who live much closer to the ground. They did not attempt to remove most of the plutonium which has been deposited around the test sites, they preferring to bury it or plough it in. They left 120 square kilometers of bushland contaminated with very small particles of plutonium and did not inform the Australian government of the full extent of the contamination from millions of plutonium-covered metal fragments. It was only during the McClelland Royal Commission into British nuclear tests in Australia in 1984 to 1985 that the Maralinga people, who were represented before the Commission, commenced to have access to the scientific and other information relating to the test sites. 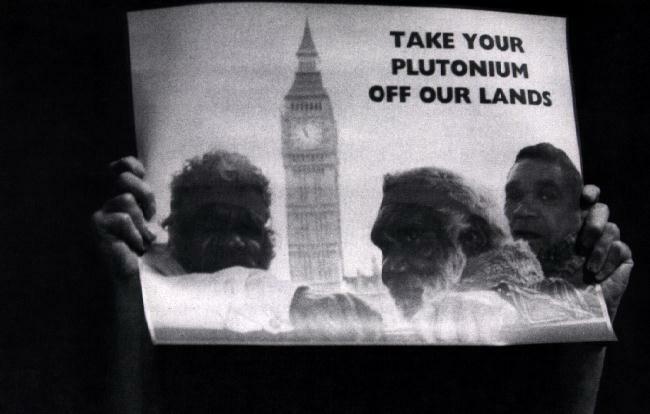 However, even the Royal Commission was unable to determine the risks posed to the Maralinga Aboriginal people by the remaining radioactive contamination, since all risk estimates made by the British government assume a western lifestyle. The Royal Commission recommended further research on the risk for traditional Aborigines and the option for cleaning up the sites to a state fit for permanent habitation by them. The Australian government acted on this recommendation and established a Technical Assessment Group, TAG, comprised of five eminent scientists from Australia, Britain and the U.S. The TAG worked closely with the Maralinga Aborigines and presented its report in October, 1990. As part of the TAG report, the Maralinga people made an anthropological study of their diet and lifestyle and this was the most important information in calculating the risk to the Maralinga people living in the traditional way from the plutonium spread over their land. A TAG map of contamination, identifying the plumes. -- This is Maralinga: In the top end of the corner is the community that we have decided to resettle people on the land, 100 miles from the test site, and here is where the area is restricted by the government that we can't even enter. It's controlled by two protection service officers at all times. There is a vehicle going into the forbidden area to keep people out. That area, as you can see, there is no trees, there is a monument. The people, my people are still nomadic, they rely on traditional food. You can see a lady there, she is just hanging onto a baby kangaroo, her husband just went there and got a kangaroo, another lady walks around the bushes to collect some grubs, she's got a handful there, it was a successful day for her. That old gentleman has been rabbitting in their country. We call it underground mutton. This slide is very important, because it indicates how close my people live to the earth. The easiest way for pollution to get into the body is by breathing it in or by swallowing it with food or drink. This stable-like building is a fairly large water tank, that's the only way we get water on our land, scattered every 50 kilometers apart. These slides just show why the pollution is more dangerous to my people. The TAG report outlines six clean-up options, ranging from fencing off the 500 square kilometers of the test area at a cost of ten million Australian dollars to performing a complete cleanup of all contamination at 600 million of Australian dollars. The Maralinga community has considered the TAG options with its scientific and legal advisors and they want all the contamination removed and the burial pits made safe. However, in the case of the 120 square kilometers of bushland contaminated with fine particles of plutonium, the Maralinga people have been placed in a terrible environmental dilemma. The only possible way to decontaminate the plume area is to remove every tree and plant and all the soil to a depth of four inches. The people see this as creating one environmental disaster to solve another and are reluctant to see that happen to their land. The Maralinga people have told the Australian government that they want all contamination from Emu and Maralinga cleaned up, a permanent fence put around the 120 square kilometers of plume area, compensation for the fact that they will lose the use and enjoyment of the fenced area for the next quarter of a million years. The Australian government has put a proposal for a clean-up to the British government. The Australian proposal incorporates the position of the Maralinga people. It is nine months since the proposal was made. To date, there has been no response from the British government. The Maralinga people are worried about this, because they are vitally affected. We will be travelling from this conference to London to have talks with the British government. TAKE YOUR PLUTONIUM OFF OUR LANDS ! I want to thank you all people for sitting here and listening to our story. There is one last thing. There's a video made last year by the BBC which describes "Secrets in the Sands". A very strong, a true story about my people. We will show it tomorrow night. Once again, thank you for being so patient and listening to our story.